Last night was the cocktail party for my husband’s work, which I attended as his plus-one. This is a yearly event held early every Christmas holiday season, and the general purpose is for middle- and upper-management to schmooze with clients. In years past it was open to all employees, which I got a kick out of because it was one of the few chances to see a lot of the non-managerial staff dressed in their finest, since so many of them never get more formal than jeans and a T-shirt for the average work day. I do miss that. Of course, I don’t have anyone that I need to schmooze with; as the spouse of an employee, my role is mostly ornamental, although I am expected to occasionally make polite conversation. Mostly, it’s pretty much understood that I am there for the free food and drink. And boy, does the company put out a spread! 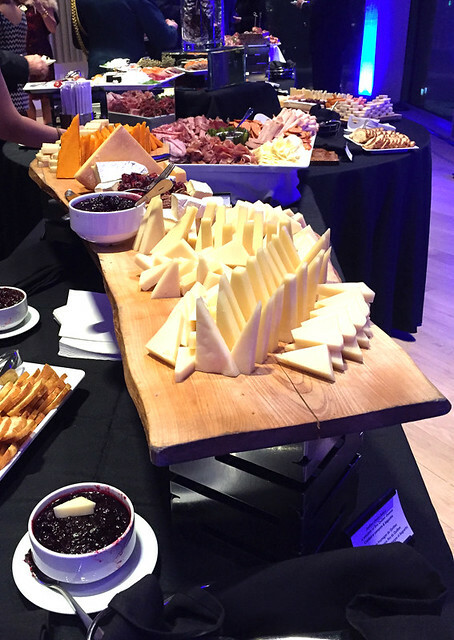 This year the event was held at the newly-renovated NAC (National Arts Centre), although for many years prior it was held in a banquet hall at the nearby Westin Hotel. The cold buffet was splendid. There was a wide array of Quebec cheeses (foreground center and background right), along with a delightfully large selection of sushi and sashimi (background left, where people are serving themselves). 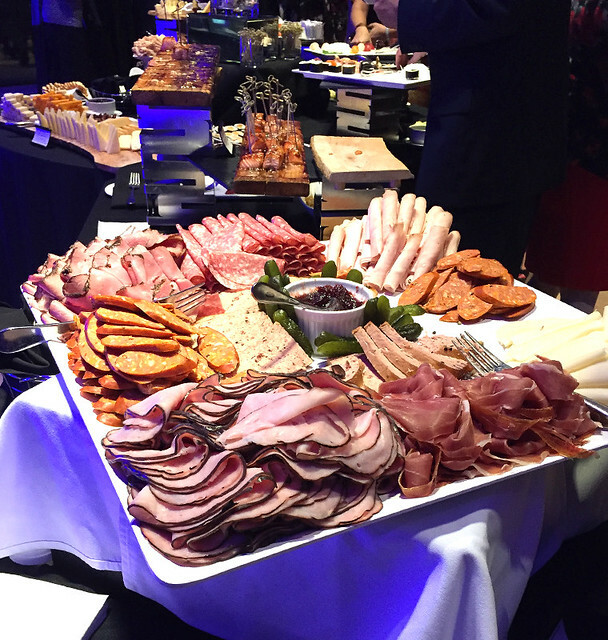 The cold buffet also featured a couple of charcuterie platters (front and center) and, my favourite on the cold buffet, maple whiskey planked Chinook salmon with onion marmalade and caper remoulade. 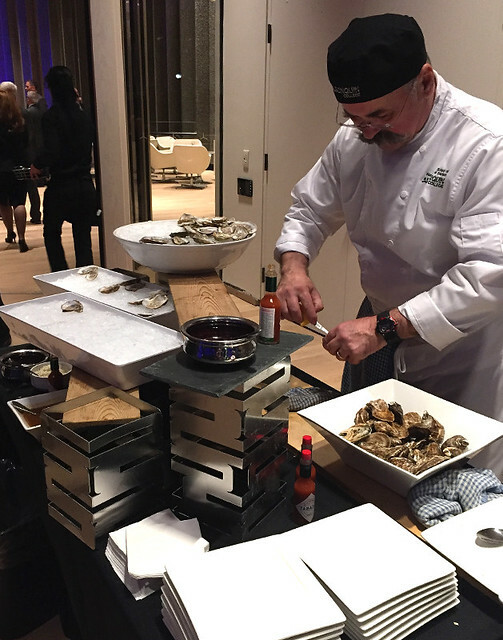 There was an oyster bar where some of the caterers were shucking oysters fresh all evening. I’m told that there’s a real technique to doing so without slicing the crap out of your fingers; I’m pretty sure I’d rather not give it a try, myself. These oysters were tasty and fresh, and although I know they’re not everybody’s cup of tea, I quite enjoyed them. My husband tried his first oyster on the half shell last night and proclaimed it to be “meh”, mostly because of the slimy texture. There were also a number of hot food stations scattered throughout the halls. Of course, the portions were tiny so that one could have a bite of this and a bite of that, but there was no limit as to how many each guest could take. 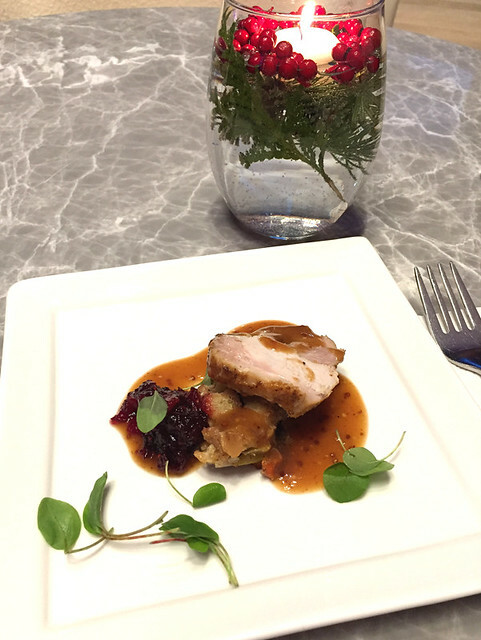 There was a take on the traditional roast turkey with dressing, gravy, and cranberry sauce. 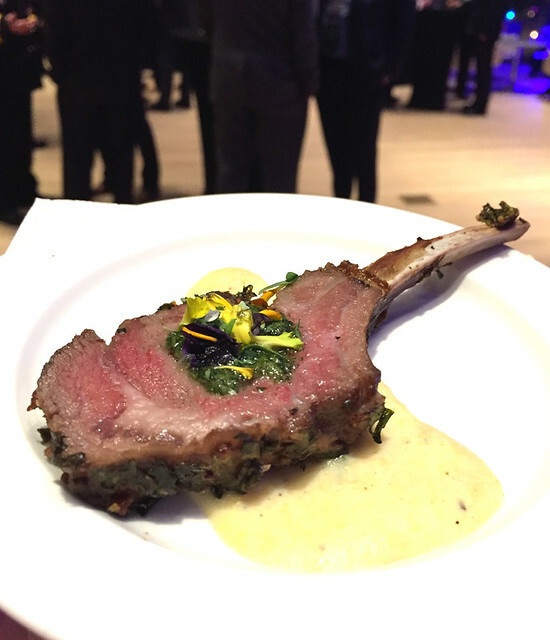 The plate was garnished with microgreens. (What is it with this microgreen trend lately? They’re everywhere! It’s like how everything used to be garnished with parsley in the 70’s.) This was decent, with the highest point being the flavour of the gravy, but overall it was missing “oomph”. The lamb was much nicer than the turkey, with a very soft texture and a savoury accompanying sauce (which I believe was polenta-based). And, of course, microgreens. The funniest dish of the evening was what the servers called a “beef martini”. 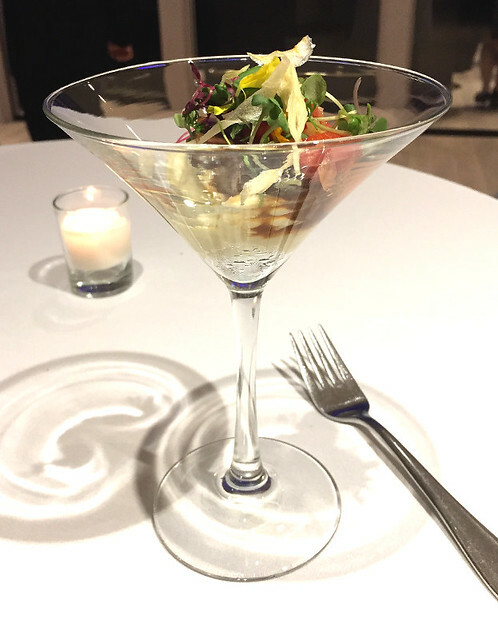 In each martini glass, starting from the bottom, was mashed potato, roast beef in gravy, tomatoes, microgreens (! ), and crispy fried bamboo shoots. Despite the name, the dish is meant to be eaten with a fork, not drunk. The beef was melt-in-your-mouth tender, the tomatoes were perfectly seasoned, and the crispy topping set the rest off in an interesting fashion. There was usually a line at this station throughout the night. 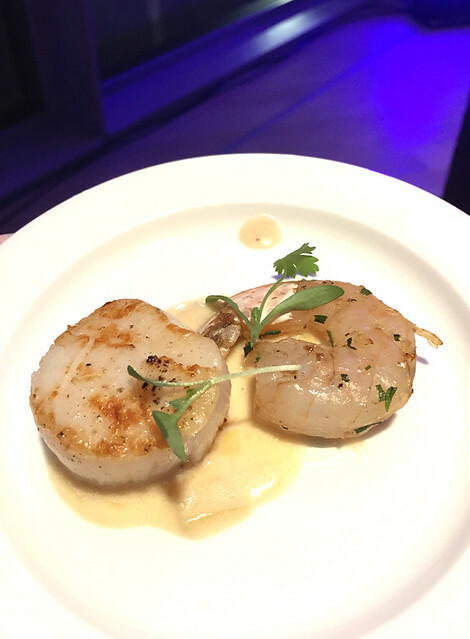 My favourite dish of the evening by far was the seared scallops and jumbo shrimp in Maker’s Mark whisky, on a smear of Gruyere white sauce, with a scattering of microgreens (!!). The seafood was cooked up fresh to order and there was always a line at this station, with people coming back again for more over and over again. The scallops were melt-in-your mouth, and although the shrimp were not as excellent in comparison, they were still very good. 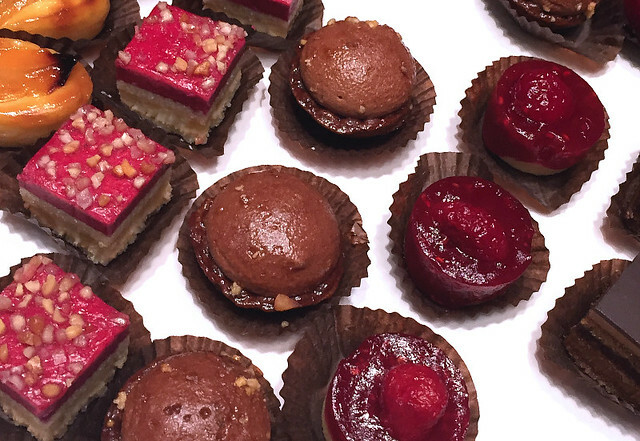 After speeches by the company’s head honchos, the desserts were brought out. 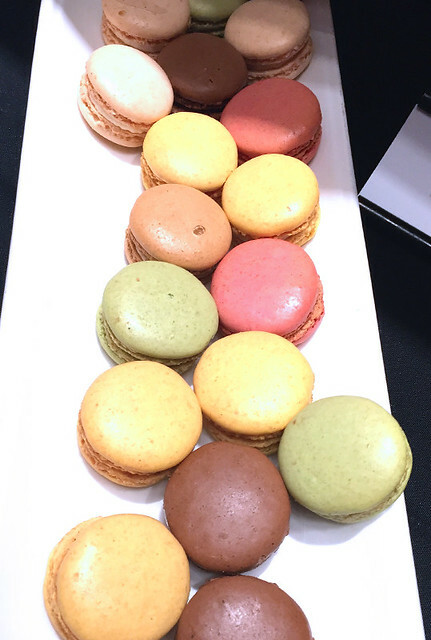 There were French macarons, which I had seen many times but I had never actually tried before. I had expected them to be more crispy and wafer-like, but they were actually quite soft. 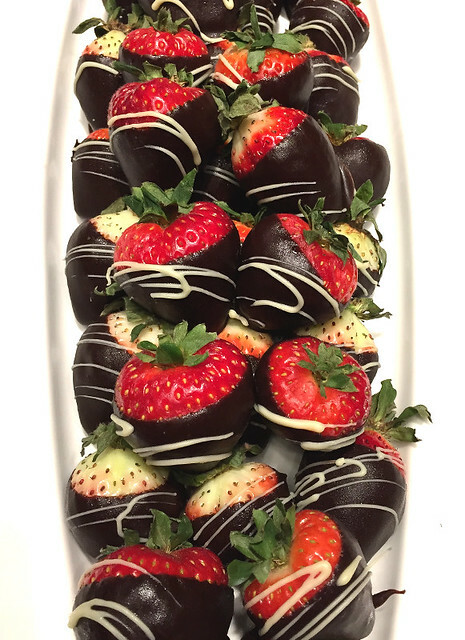 As always, the chocolate-covered strawberries were a hit. I didn’t try all of the dessert mouthfulls, but the peach thingies (upper left corner) were quite nice. The brown desserts at the center of the photo were not chocolate like I’d anticipated; they rather surprised me with a strong sour lemon flavour. Once I got over my initial shock, they were quite nice. And the traditional Nanaimo bars on the right hand side of the photo were pretty good too. All in all, I had a lovely time at the cocktail party. I returned home stuffed to the gills and just a little bit tipsy. I loved the new venue, with its huge windows and views of the Chateau Laurier, War Memorial, and Parliament Buildings. I liked every food I tried, and I even loved a few of them. I do miss a few dishes that were standards at the old venue, like the roast lamb stuffed with rice pilaf (I’m pretty sure they did that same dish every year for over a decade and each time it was cleaned down to the bones). Last year they also served Oka cheese melted raclette style from a half-wheel and spread over something… Bread? Potatoes? I ccan’t remember now, all I remember is that the cheese was delicious and I was really hoping for it again. However, I’d trade the Oka for this year’s scallops in a heartbeat. Posted on December 1, 2017 November 30, 2017 by owntwohandsblogPosted in Cooking, ExploringTagged catering, Christmas, cocktail, food, holiday, local, party, restaurant.